In this digital age, we’re constantly tethered to work. Physically leaving the office doesn’t always entail doing so mentally, thanks to the office in our pockets. Responding to after-hours work email is tempting for some and necessary for others. But fielding work emails after hours may not be so good for an employee’s emotional well-being, according to a new study. 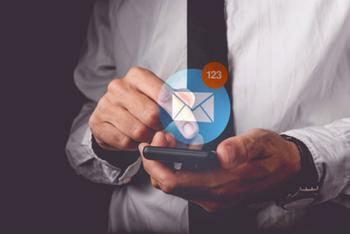 Conducted in the wake of a recently passed labor reform law in France, which banned checking email on weekends, the new study suggests that employee health and productivity could be negatively impacted by after-hours email expectations. These expectations, set in motion by the sheer availability of workplace technology, may be throwing off an employee’s work-family balance and leading to chronic stress. The results of a study of 297 working adults revealed a link between organizational after-hours email expectations and emotional exhaustion. This type of emotional exhaustion, suggests lead author Luiba Belkin, may contribute to employee “burnout” by impeding the process of mentally detaching from work. But it’s not the act of checking email or the time spent in one’s inbox which leads to diminished employee health. It's the expectation. The nagging feeling of anxiety that may come as a result of feeling obligated to check email after-hours is known as anticipatory stress, and research shows it can leave employees feeling utterly exhausted even during their down time. "This suggests that organizational expectations can steal employee resources even when actual time is not required because employees cannot fully separate from work," the authors wrote. Even if an employer hasn’t explicitly instructed employees to check email after hours, employees may still assume they are expected to. A company’s organizational culture (AKA what leaders appear to define as acceptable or unacceptable) may send cues as to what is expected. Belkin explains that if, for instance, a company has an ‘always on’ culture, it may prevent employees from psychologically distancing themselves from work. So what can managers do to combat the stress created by implied after-hours work email expectations? If banning email after work altogether isn’t an option, Belkin suggests either implementing weekly “email free days” or offering rotating after-hours email schedules to help employees strike a better work-family balance. Policies like these may do more than foster employee well-being. They may also signal that an organization is caring and supportive, which Belkin believes could potentially increase employee trust and bolster job commitment.